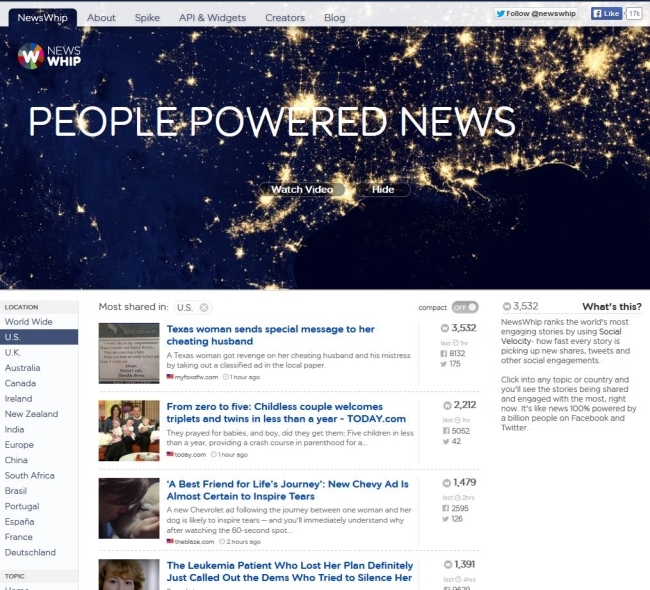 Social media news aggregation and analysis platform NewsWhip relaunched its website to bring users the most shared stories via Facebook and Twitter from countries including the U.S., U.K., Ireland, Australia, Germany, France, and Spain. NewsWhip lists news stories with the most social engagement each hour, and its redesign now makes the site smartphone- and tablet-friendly. 686,649,676 Facebook interactions for shared content (332,402,592 likes, 155,873,396 shares, and 138,112,713 comments). A daily average of 22,149,989 Facebook interactions. 60,260,975 tweets and retweets, for a daily average of 2,008,699. Nearly 250,000 stories tracked each day from some 30,000 sources. Much of the time, the stuff we call news is press releases and canned statements. Ironically, these words will go into a press release. Anyway, we think the really interesting stories often got buried in the past. But today, people find those stories and share them on Facebook and Twitter. And then we push them right up onto our front page. We don’t care what the editor picks — we care what the people have chosen to engage with. Some perceptions about viral content are quite off-base. It’s not all cats and lists. When you drill into any section of NewsWhip — like science, or fashion, or politics — you can see what stories are animating the people who care about those topics. Taken together, all of those signals are an amazing quality filter. Each day, we add another 250,000 newly published stories to our coverage, from 30,000 sources. Of those, 20 percent will get some kind of social traction and start picking up shares. Those quality signals are important indicators that something is happening, especially when they start to add up — our algorithm starts paying attention. By the end of each day, we’ll track over 30 million social interactions with content, and we’ll have identified the top stories in thousands of niches. Readers: Will you check out the revamped NewsWhip site?